It’s hard to think of a single musician whose work has been so influential: classical composers admire his structures; pianists still try to emulate his style; even his showy performance techniques have been copied time and time again... The Duke, however, was one of a kind. During his fifty year career, he recorded with many of the greats of jazz, creating a wealth of legendary music. 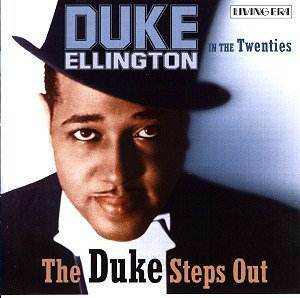 The Duke Steps Out goes back to where it started - in the seedy haze of the Kentucky Club in 1924 - and traces his work through various bands throughout the next five years, leading at last to the six-piece brass team with whom he would shake the jazz world. With fifty years worth of developing talent available to buy on disc, one might be forgiven for asking: why choose a collection from so early a period, when Ellington was still a comparative amateur? And as far as his skills as a pianist are concerned, this is indeed a valid point. Lacking the flair of his later work, Ellington’s solos are relatively bland, and rhythmically unimpressive - a fact cruelly emphasised by the tendency of his accompaniment to dampen down, or cease altogether, in order to bring them to the forefront. Even as part of the rhythm section, his efforts are rarely notable, quietly plodding through the necessary chords as the banjo or bass thumps the melody forward. But it isn’t for Ellington’s virtuosity that the collection is so appealing - but rather for his masterful talents as composer and, indeed, for his role as band leader. Perfectly structured, richly textured and always brilliantly orchestrated, it little wonder that many of these tunes have been compared to classical works. As the British composer, conductor and writer, Constant Lambert, put it: "There is nothing in Ravel as dextrous as the varied solos in the middle of the ebullient ‘Hot and Bothered’ and nothing in Stravinsky more dynamic than the final section’. And, indeed, there is little in any musical genre to compare with the blistering ‘Tiger Rag’. Filled with weird and absorbing textures, sliding and zapping in to every possibility, this is truly groundbreaking stuff, captured by a group of gifted musicians. Indeed, it is ultimately the accompanying musicians that give this collection its wonderful character. From Bubber Miley’s wa-wa trumpet to Adelaide Hill’s wordless vocals, eccentricity, charisma and joy seep every warbling note. There is a certain freedom about this music that is rarely found in recordings of the era. There is also, however, a sense of unity that never get lost in self-expression. In his linear notes, Vic Belerby addresses this apparent paradox: "The great soloists were exhorted to ‘get off’ and improvise... They always did, yet in a way peculiar to Ellington. Such was the secret of his genius."